"It is very important to be prepared for potentially challenging outbreaks of flu variants, especially when they appear to spread easily between humans and animals,"says Sri Edupuganti, MD, principal investigator of the H3N2v clinical trial at Emory's Hope Clinic. The Hope Clinic of the Emory Vaccine Center is one of four U.S. centers participating in a national clinical study of an H3N2v influenza vaccine in healthy adults and elderly individuals. 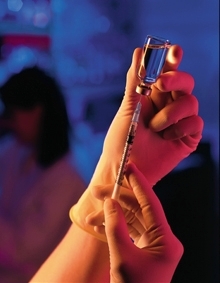 The National Institute of Allergy and Infectious Diseases (NIAID), part of the National Institutes of Health (NIH), is sponsoring the study through four NIAID-funded Vaccine and Treatment Evaluation Units (VTEUs): Emory Vaccine Center, Baylor College of Medicine, University of Iowa, and the Group Health Research Institute in Seattle. Principal investigator is Wendy A. Keitel, MD of Baylor. H3N2 influenza viruses typically circulate in swine, but variants —denoted with the letter "v"— sometimes circulate in people. In July 2011, an H3N2 variant containing genetic material from the 2009 H1N1 influenza virus was discovered in patients with flu-like symptoms. Since that time, there have been 321 confirmed cases of human infection with this H3N2v virus. Most of these infections have been associated with direct and prolonged exposure to pigs at agricultural fairs, although some person-to-person transmission has occurred. Symptoms of H3N2v infection are similar to those of seasonal influenza: fever and respiratory symptoms (such as cough and runny nose), sometimes with body aches, nausea, vomiting or diarrhea. "We are pleased to be participating in this important national clinical trial," says Sri Edupuganti, MD, principal investigator at the Emory Hope Clinic. "It is very important to be prepared for potentially challenging outbreaks of flu variants, especially when they appear to spread easily between humans and animals." The U.S. Centers for Disease Control and Prevention generated and distributed an H3N2v seed virus to the Biomedical Advanced Research and Development Authority (BARDA), a component of the U.S. Department of Health and Human Services, to create an investigational vaccine. BARDA contracted with the Lyon, France-based pharmaceutical company Sanofi Pasteur to produce the vaccine for testing. The Phase II vaccine study will enroll up to 240 healthy adults in two groups: group one will include at least 100 (up to 120) participants ages 18 to 64 years old, and group two will consist of at least 100 (up to 120) participants ages 65 and older. Both groups will receive a 15 microgram (mcg) injection of the H3N2v vaccine on their first day in the study and another 15 mcg injection 21 days later. Pregnant women are not included in this study. At Emory, recruitment has been completed for the younger age group, but enrollment is still underway for healthy adults who are 65 years and older. Participants’ immune system responses to the vaccinations will be assessed by blood samples drawn five times over 42 days. Researchers will also evaluate individual participant reactions at the injection site and will monitor for adverse events and the development of new chronic medical conditions for up to seven months following the first injection. Emory’s Hope Clinic is also conducting additional laboratory assays to evaluate the B cell responses and cross reactive antibodies to influenza subtypes. Participants are permitted to receive the licensed seasonal influenza vaccine prior to their first injection with the H3N2v investigational vaccine. The seasonal vaccine must be received at least two weeks (if given the inactivated vaccine) or four weeks (if given the live, attenuated vaccine) prior to the first H3N2v injection. Alternatively, seasonal influenza vaccine may be made available at no cost to all participants after 42 days in the study. If early information from this study indicates that the vaccine is safe, a similar clinical trial in healthy children ages 6 months to 7 years of age will begin. Information about the clinical trial is available at ClinicalTrials.gov under the identifier NCT01746082. For more information about the clinical trial at Emory’s Hope Clinic, call 877-424-HOPE or vaccine@emory.edu.